Graaff-Reinet, the fourth oldest town in South Africa, is a jewel in the crown of the Camdeboo district of the Karoo. It is also the home of our self-catering guesthouse, which is the preferred accommodation option for many travellers and visitors of our fascinating, ancient section of the Karoo. “Camdeboo” is said to have evolved from a Khoi word meaning “green hollow”, an apt description of the features surrounding Graaff-Reinet, particularly the adjacent Camdeboo National Park’s Valley of Desolation, with its unique dolerite rock formations and sheer cliff faces that tower to a height of around 120 metres over the steep gorges in the green valley below. It is easy to picture this wildly magnificent valley as a sanctuary of the ancient Khoi. For tourists and visitors of Graaff-Reinet, who choose from the town’s accommodation options and decide to stay at our affordable, luxurious self-catering guesthouse, the Camdeboo National Park is a must. A few hours or even days spent at the park is a feast for nature lovers’ senses. More than 220 bird species have been recorded here. Among them is the heaviest bird to fly in the African skies, the rare Kori Bustard, weighing in at 5,5- to 19kg, and the regal Black Eagle, always on the hunt for prey. Our 43 mammal species include the endangered Cape Mountain Zebra, Buffalo, and numerous types of antelope, including Kudu, which roam freely through the park’s 336 species of flora. It is a paradise for wild creatures, picnickers, photographers, and hikers alike. The Great Karoo is a vast semi-arid to arid desert, encompassing an expanse of territory that stretches across a 400 000 km2 area that includes parts of four provinces. The Karoo is perhaps best-known for its production of Karoo lamb and the Karoo bossies (scrub-like bushes and shrubs) that occur naturally, and on which great herds of sheep graze. This aromatic vegetation imparts a unique and distinctive flavour to meat, the likes of which originate only here. In fact, officially, Karoo lamb is now a certified food of origin, giving it a similar status to other protected products/brands of origin like Champagne and Parma ham. Typically, it is very convenient for our KarooRus guests to opt for self-catering, because they can come and go and have meals as and when they please. Nonetheless, it is also equally convenient for them to take a short walk to the Graaff-Reinet town centre, to dine, shop, visit, and view heritage sites, historical buildings, museums, and art galleries, or simply stop and chat to the warm-hearted, welcoming Graaff-Reinet residents. The options are there and the choices are yours. The wisdom of taking frequent breaks when travelling, particularly if the journey is lengthy, is well-known. According to research conducted by road safety and physical wellness experts, this break-taking practice should take place at least every 200 km. It is essential for your safety and the safety of other road users. Ideally, you are supposed to pull off the road in a safe place, get out of the vehicle to stretch your legs, walk around, take a nature break if necessary, and have a cup of coffee and some food before resuming the trip. The body relaxes, eyes get to rest and refocus, blood circulation improves, and the mind gets a break from concentrating and anticipating potential hazards on or near the road. The same applies to overnight stops when travelling by road. You need to rest and refresh your mind, body, and senses. South Africa is a vast country. Our national roads and byways cover massive distances, and towns are far apart in rural regions, like the Karoo, where drivers can easily become mesmerised by a seemingly endless stretch of road with few visible features and diversity when travelling at speed. Graaff-Reinet is South Africa’s fourth oldest town (only Cape Town, Stellenbosch, and Swellendam are older). It is a perfect overnight stop along the N9, when travelling to or from the inland and coastal regions where the Western Cape and Eastern Cape meet. It is a charming town with friendly, down-to-earth people, who welcome visitors to Graaff-Reinet with true Karoo warmth, sincerity, and hospitality. 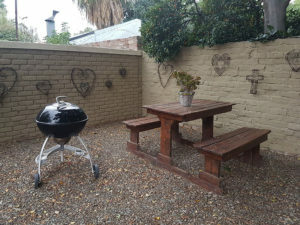 Our comfy, well-appointed self-catering guesthouse, KarooRus, is situated in the heart of peaceful Graaff-Reinet. We offer affordable luxury accommodation. We are just a few minutes’ leisurely walk away from the town centre. In town, we have a collection of fine restaurants, coffee shops, informal eateries, and shops, just in case you would prefer to eat out rather than self-cater when accommodated at our establishment, or if you need to buy supplies for yourself. We are proud and delighted that many of our former KarooRus guests have said that they have enjoyed their accommodation and stay at our guesthouse so much, that they intend to make it a point to stop in Graaff-Reinet, and book more than one night’s remarkably affordable accommodation. Our town and guesthouse have become chosen destinations in their own right. KarooRus accommodation consists of seven individual self-catering units, one of which accommodates two people. Five units can each accommodate four guests, whilst our family unit can accommodate six people. All our guest accommodation units have private entrances and are air conditioned, so hot Karoo summers and chilly winter nights do not detract from the affordable luxury and relaxing comfort at KarooRus. Our neat, immaculate kitchens are each equipped with a fridge, microwave, two-plate stove, kettle, toaster, pots and pans, cutlery and crockery, and a washbasin. You will have everything you need to cater for yourself and/or your travel companions. Our name, KarooRus, means “rest in the Karoo”, and it truly is a place of peaceful, tranquil rest and relaxation in the Karoo, offering excellent and affordable accommodation. Currently, in mid-2018, rates range from R400 to R550 per night for affordable self-catering luxury in the quaint and charming Graaff-Reinet.